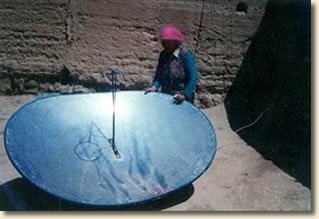 Based upon the continuing generosity of our contribution team, we were able to assist the Shem Women’s Group by funding their Solar Cooker Project for the Tibetan villages of Ragongma and Dzelungtang in China. This woman’s name is Sermo Tso. She came to Dzelungtang Village after marrying her husband. She used to spend much time gathering fuel every morning. 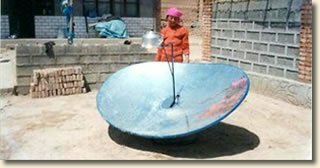 Now, after receiving a solar cooker, she has a lot more time to do other necessary tasks. Women and children spend many hours of the day attempting to gather wood or yak dung to use for cooking. They need to travel great distances simply to find enough fuel for their cooking needs, and this also causes damage to the local forests. This woman’s name is is Dorgar Tso, from Ragongma Village. She was very happy to receive a solar cooker. Now, she has more time to spend on other things such as washing clothes. Through this project, 42 solar cookers were provided for households in Ragongma and Dzelangtang Villages. The goal of this project was to greatly reduce women’s labor as well as that of school-aged children, to protect the forests, and prevent further environmental degradation. 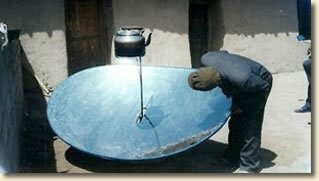 Click here to view the Solar Cooker Project Report for Ragongma and Dzelungtang Villages from Shem Women’s Group. The solar cooker focuses the heat of the sun directly onto the pot hanging in the middle. Powerful and efficient for cooking. Huadan is from Ragongma Village. 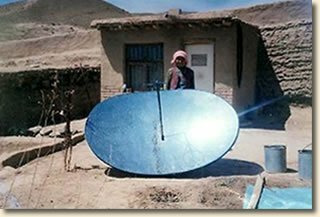 He said that now he doesn’t need to worry about collecting fuel since he received a solar cooker. This woman’s name is Tsomo, from Dzelungtang Village. 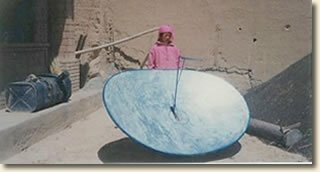 She said that she doesn’t need to spend the whole morning collecting firewood since receiving a solar cooker. A 17 year old girl from Dzelungtang Village. She was never able to attend school because of her family’s low income. She said that her whole family is very happy with the solar cooker.